← Spam or no spam? You be the judge……. In a recent email I sent to my sister-in-law (you may know her as Raree in the blog comments section), I happened to mention that if she thought of a subject for my blog, to please let me know. Later, my brother-in-law sent me the link to a web page http://blog.sfgate.com/mlasalle/2012/01/05/oscar-mistakes-best-picture/. In short, this article lists all the movies the author believes were not really the best pictures of the year, even though they won that coveted award. I have never done a movie review blog and don’t intend to get in the habit now. It’s just that one of their choices really rankled me. 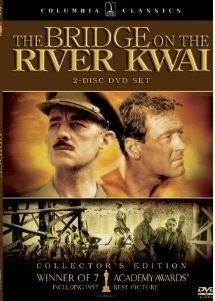 “The Bridge on the River Kwai”, made in 1957. This great movie was deserving of best picture on many levels. Suspense, action, spectacular scenery (filmed in the lush tropics of Sri Lanka), morality, a can’t-get-it-out-of-your-mind music theme, and in a sense, historical value. Though this particular event is fictional, the movie is based on the actual forced labor of captured British soldiers to build the Burma rail line for the Japanese during 1942-3. To begin with, my hero in life, my grandfather, took me to see it. Any memory with him is going to exert a positive influence on my take on any event, whatever it is. (Think a Saturday afternoon at Ebbets field in Brooklyn watching the Dodgers play the New York Giants before they both became turncoats). Anyway, as an impressionable young teenager, this was my first experience watching a war film that wasn’t just a cookie-cutter style, blood and guts, rah-rah for the good guys type of movie. This one made me think. It had something for everyone. For the guys; action of course, but revealed in the main character, Colonel Nicholson, a subtle machismo that sets the standard for what real heroism is. For the ladies; a buff William Holden. I don’t mean this to suggest any shallowness, but c’mon, he was the most handsome actor of his time. For the intellectual purists; an Oscar winning performance by England’s Alec Guinness. Played to a tee by Guinness, this was a thinking man’s officer, who rose above the circumstances to instill a sense of moral pride in his men. By convincing them not to malinger or sabotage the building of the bridge, he gave them back their sense of dignity, long ago lost at the hands of the obsessed concentration camp commandant. The clever plot revolves around two schools of thought. Whether building this bridge is a monument to British morale and pride amidst the chaos of internment or an outright collaboration with the enemy. The surprise ending answers that question for you. But probably the most memorable part of this extraordinary movie is the theme song, “The Colonel Bogey March”, written in 1914, during the era of another world war. It was composed by Lt. F. J. Ricketts a British army bandmaster. But you will swear it could only have been written for this remarkable movie. At the beginning, it’s catchy martial rhythm serves to depict the seemingly unbreakable spirit of the prisoners. Then, almost mystically at the end, it morphs into a haunting, solemn reminder of what has just taken place. Click here to hear it played on YouTube. I defy you to go the rest of the day without whistling this to yourself. Do yourself a favor and rent this movie sometime. If you haven’t seen it, forsooth! If you have, it’s about time to treat yourself all over again. “Why did the moron throw a sack of onions in the river? Because he wanted to see the bridge on the river kwai.” Sorry. This entry was posted in Misc and tagged Alec Guinness, Bridge on the River Kwai, Oscars, William Holden. Bookmark the permalink. 24 Responses to Excuse me? OK, time to ask the question.. Do you think your dad and I were separated at birth? Good chance, he was a conjoined twin, but lost contact when separated…. Do you have a funny looking scar on your left ear? I still think this is a great movie and deserving of an academy award. And just the mention of this film makes that tune pop into my head, I won’t be able to sleep tonight. Thanks, Big Al. Sorry about that, Susan. If it’s any consolation, I’ve been whistling ever since I wrote the blog. I tend not to watch war movies or westerns. But, because you’re my Pal Al, I’ll take your word for it and that tune is very catchy. The joke at the end was school yard lame and I loved it! Well, at least you found a new tune to whistle while you blog. Again, sorry about the joke. Was is fact is that there were thousands of British troops used to forcefully build the Burma rail line including a famous bridge that was eventually blown up by allied bombers. In addition there were captured soldiers from India, Australia, New Zealand and America used. The American troops (around 400) were sailors picked up by the Japanese after they sank the USS Houston in the Java Sea. Another myth is that college professors actually teach without bias. Okay, I will be the one to disagree. I hated this film. I don’t know if it was Oscar-worthy or not, but i absolutely hated the film when I saw it way back when. To add insult to injury, one of my history professors says it is a myth or what some call “spin” these days. I don’t know if that is true or not either. I was bitterly disappointed when the English Patient did not will best everything. I read the book so I understood the film, which seemed to be the complaint of many who saw the film and did not understand it. I have watched this film over and over. Another film I have watched a dozen times or more (no kidding) and never found a single flaw in i t is….Shakespeare in Love. Top notch and if your know your Shakespeare you probably get more of the jokes than not. Loved it. What a great way to start the New Year…with that “Kwai” music in my head! Thanks Big Al! One of the great “Best Picture” rip-offs was when “Shakespeare in Love” won over “Saving Private Ryan” ! Thanks, Mike. The website I linked to speaks to that injustice. Like in the Olympics, the events that are decided by “a panel of judges” is always suspect. Give me hard facts every time to decide who a winner is. Fastest time, longest or highest jump, most points or in “Ryan’s” case the highest grossing film of the year. That’s one war movie (along with The Great Escape) that I will always stop to watch when I catch it on TV. Love Alec Guinness in it. Just another example of how similar our tastes are, Peg. Yes, and are you as concerned about that as I am? Well, I am sorry that you were dealt such a hand. An excellent defence of a great movie! I always thought it was a true story. My understanding is that there is no actual event similar to this although a famous bridge on the Burma line was destroyed, but by allied bombs not saboteurs. It’s not hard for me to imagine a character like this stepping up in the real life of WWII concentration camps. I’m not much for war movies, so I will take your word for this, but if I find it available in B&W I may watch it someday. You definitely want to watch it in color. A large part of the appeal is the cinematography and the gorgeous landscapes. Thanks Bella. Nothing wrong with chick flicks. We’re suckers for them, too. We just rented “Midnight in Paris” the other night. A delightful movie and a visual feast of Paris.